When considering any possible scenario that would cause you to not have electricity you must consider where you are going to get light from. Simply having a few flashlights and some batteries is a great start but perhaps one might consider longer term lighting options. The advantage of using these in your yard as part of your landscaping is that you instantly have an emergency preparedness option! If your lights go out you can easily run out and grab a yard light and pop it in a vase and voila, instant light in your house. Yard light brightness varies so be sure to choose a good quality solar yard light. For those of us on a budget, you can even find these at the Dollar Tree…for a buck! Dollar Tree lights are not really bright but they will work in a pinch. Often you can find these on sale at Costco as well. The really nice thing about these is that you can charge then during the day and have about 4 -6 hour of light at night. Solar yard lights would not pose a threat of fire in a child’s room or in a tent situation. This is a great option to have in your home for any short term emergency. Having regular and rechargeable flashlights handy with extra batteries is a good idea. Know where they are located. Better yet, keep a drawer or bin specifically for flashlights, extra batteries, matches and candles in the event of a power outage or emergency. LED small flashlights like the cheap ones available at Harbor Freight are excellent to have sitting next your bed in the event of an emergency. Check your batteries every year. Costco usually has very bright (300 lumens) 4-pack of lights and a single 1300 lumens flashlight for under $20. *hint: Some say to store your extra batteries in the freezer to prolong their life. For your 72 hour kit you may want to consider having a battery operated LED headlamp in each pack. This eliminates the cumbersome carrying of an extra flashlight and frees up your hands. The batteries in these usually last quite a long time but make sure you always have extra batteries available. Wind up flashlights do not shine for a really long time but no battery is needed so these will be great to have when you no longer have access to batteries! Make sure to get an LED model as the light is much brighter and the bulbs last a very long time. Coleman propane lantern with case. Click image to see Walmart price. When considering lanterns, you certainly do not need to get all of the options out there but do your homework. Propane is said to only last for 1 year in the green canisters, but I have had them last longer. Propane is a great option if you have a good storage of propane and realize that the green canisters might not be good for long term storage. A lot of people have propane lanterns for camping so if you already have one on hand make sure you have some extra propane. Battery operated lanterns in LED usually have 2-4 settings and can last for quite a long time. Make sure you store extra batteries, as well. The number 1 choice for a lantern is the solar/wind up option. They are about $35 on Amazon and last for a very long time. You can charge during the day with the sun and wind up at night if you run out of juice. These come in Led which offers a nice amount of light, most of these also have a red emergency light setting too. Oil Lamps seem archaic but in time of extreme emergency these are a very nice option. Be careful using indoors as these can start a fire. Learn how to fill and use your oil lamps before you have to out of necessity. This is a very inexpensive option! Walmart carried a nice oil lamp for under $10 and the oil is affordable too. Have at least a gallon on hand, if not more. Make sure you store extra wick, as well. The light from an oil lamp is soothing and inviting and warm, rather than LED blue light. Consider storing either candles or oil lamps for a rest for your eyes in long term emergency situations. 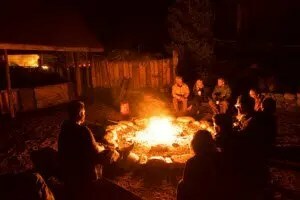 A tiki torch is basically an oil lamp on a skewer for lighting your yard or tent path. These are an excellent option for outdoor lighting. Glow sticks are not for eating. Glow in the dark anything is fun for kids! While glow in the dark sticks and paint do not glow for more than about 4-6 hours and they are done, they are still a fun option to incorporate in your emergency preparedness. You can also find 12 hour glow sticks on Amazon. Glow sticks can be a great idea to stuff into your kids 72 hour kits! They will have fun breaking them to light them and it can be a great distraction in a dire situation. They are lightweight and last for a long storage time. Be careful not to break them open because, depending on the type you have, the solution inside may be minimally toxic causing some skin irritation. Painting your planters outside might be an idea for you. Be warned that the best glow in the dark paint is usually a bright and obnoxious orange or neon color when not glowing in the dark. Be ready to have a very bright yard! This would be a neat idea to just do for fun and the benefit is later, down the road, you will have a well-lit path for your disaster time. Haha! Have fun with this idea! Planning and putting together a glow in the dark ceiling for your kids room will be a nice way to ensure that when the lights go out they are not afraid, their room will be well lit for a few hours, just enough for them to go to sleep calmly. This is a must if you have a child that is afraid of the dark at all. I like to think of things that would be fun but are also an emergency prep item too. There are many types of candles out there but I recommend a soy candle because they burn less smoky. You can easily order wax and make your own and they do not smell. Consider getting scentless candles for your emergencies because when in a small area you may get a headache from scented candles. Candle light is great extra option to have, as discussed earlier. It does not take electricity and it burns efficiently, but be careful of using them inside for fire hazards. You can make your own candles inside quart sized canning jars and seal a few matchbooks up in each one, emergency prep to go! *hint: When considering candles as your back up light source make sure you have plenty of matches and lighters stored to light them with, as well. Get waterproof and windproof matches too! Emergency essentials offers an oil candle that is ready to go. I store several of these because they are drip free, they do not smoke and they are really easy to store. The cheapest place I have found these is at Winco Foods. “Luci” lights do actually come in other brands and can be found all over Amazon.com. They range from $13-$24 each. The nice thing about these is that they can be charged and stored in a 72 hour kit for up to 3 years and as long as you don’t use the light it will hold its charge. Charging them is easy, just set in the sun. As pictured you can blow them up to varying sizes for whatever use you need them for. These do not require any type of battery. I have several of these and do recommend getting a minimum of two. They hang well in tents and they are not breakable so they are fun to have with little kids. 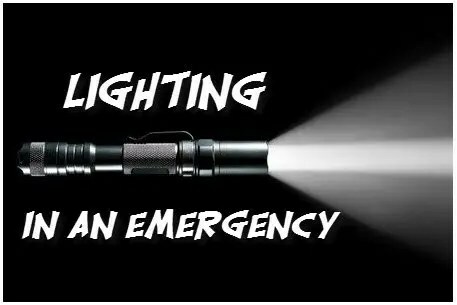 They are LED light and this can be hard on the eyes after a long term exposure so have soft candle light in the interim of using Led is always recommended for long term emergencies. What more do I need to say about fire light? Haha! Duh…if you light a fire in a fire fit or fireplace, it will provide light. Make sure you have fire-starters and matches available for easy lighting of your fire. Keep fire contained and do not use in your home unless you have a fireplace or stove. In conclusion, really research and find out what types of light you should have stored for times of emergency. Think long term and short term. Light is really important to have access to when there is none available from the city! What great ideas! Trying to add a little as we go. ☺️ Definitely wanting to be prepared!